Sarcoptic mange is a highly contagious skin disease found in dogs, caused by the Sarcoptes scabiei mite. These mites will burrow through the skin causing intense itching and irritation. The scratching that results from mange is what causes the majority of the animal’s hair to fall out. The term mange has been derived from old French manjue, from mangier, meaning to eat. Mange is an unsightly and painful condition caused by mites. 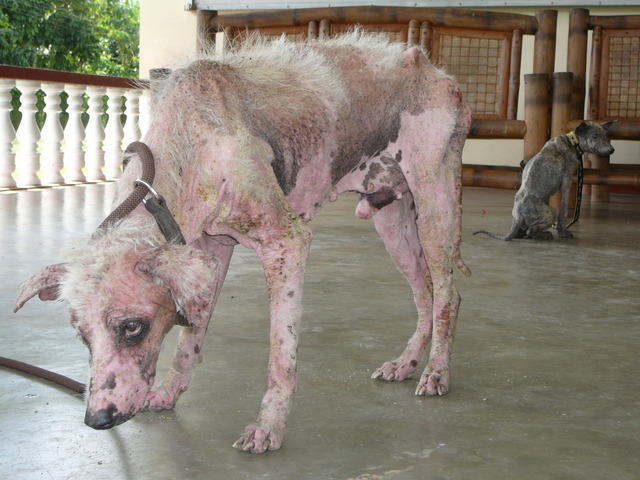 Mange is contagious and is spread by contact from infested to non-infested animals. Mange can occur in man, dogs, cats, horses, sheep, cattle and other animals. Scabies in animals are often confused with human scabies. The motion of the mite in and on the skin is extremely itchy – hence the common name “scabies” from the French scabere “to scratch” – leading to self-induced traumatic wounds that exude serum, forming crusts. Sarcoptic mange is different from human scabies. Sarcoptic mange or scabies is caused by a mite called Notoedres, a microscopic ectoparasite that burrows in to the skin. Sarcoptic mange or scabies is contagious to canines and humans. Fortunately the mites that cause mange cannot complete their life cycle on humans and die within a few weeks. ScabiesKiller products will kill them faster and relieve the itching. Damage caused by mange can mimic that caused by other skin conditions, including autoimmune diseases, bacterial infections secondary to flea allergies, and contact dermatitis. The most prevalent symptom of mange is intense itching called pruritis. This itching will inflame the skin and cause scabs with a secondary bacterial infection (pyoderma) occurring due to the trauma. The areas most commonly affected are the ear margins, elbows, and face. Some pets will shake their ears excessively and cause an aural hematoma (swollen ear). Serum (the clear component of blood) seeps out of the tunnels to the surface of the skin and causes thick scabs to form. Mange is fairly easy to kill with Scabies-Killer. The condition also may need to be treated with an antibiotic for the secondary bacterial infection and corticosteroids to decrease the intense itch and inflammation. Veterinarians usually attempt diagnosis with skin scrapings and are tested for mange. A simple way of determining if a dog has mange is if it displays what is called a “Pedal-Pinna reflex”, which is when the dog moves one of its hind legs in a scratching motion as the ear is being manipulated and scratched gently by the examiner; because the mites proliferate on the ear margins in nearly all cases at some point. It is helpful wherein all symptoms of mange are present but no mites are observed with a microscope. Like pets, humans have a particular variety of mites that can cause advanced “scabies”. This is totally separate variety from the ones that cause “mange” in dogs and cats. They just burrow in a short distance and begin an infestation that can last for years if untreated. In fact, having scabies is what is meant by “The Seven Year Itch.” Scabies cause inflammation and the resulting welts. The Norwegian scabies can also cause redness of the skin and crusting. These type of scabies are normally found in people with low immunity.